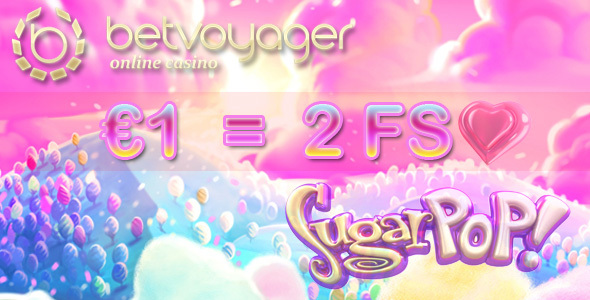 Receive a prize of two Free Spins on 3D slot SugarPop for every Euro deposited! Just follow these three easy steps to play. 1. Activate promo code FSAPRILin the Promos section of your account. 3. Get up to 100 Free Spins within a minute of making a deposit. BetVoyager Online Casino © 2007–2019 Gamesys N.V. and Gamecode Ltd., trading as BetVoyager, operates under the Curacao Gaming license #8048/JAZ2017-007 issued by the Antillephone N.V. in Curacao and under the UK Gambling Commission Remote License #000-045449-R-325760-002 issued by the UKGC in Birmingham, England. NEW GAME Claim 50 Wager Free Spins on Lucky Stripes!